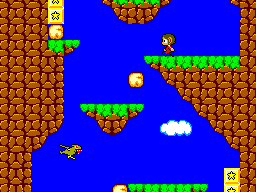 Is or isn’t Alex Kidd In Miracle World a Super Mario Bros. ripoff? I can understand why some people think so. But I don’t think that really matters and here you can see why. In AKIMW, you don’t jump on enemies; you smash them with your fist. And how can you forget the legendary rock, paper, scissors bossfights? And when have you ever seen a motorcycle or a helicopter in Super Mario? You go though one world, not 8. You have more than two power-ups. You die after one hit. These are some of the differences but I won’t say that SEGA wasn’t inspired by Nintendo’s Super Mario Bros. But I will argue that all linear platform games are somehow a Mario clone. And AKIMW does enough, so it doesn’t feel like you are playing the same game twice. On the box, it says that you travel though the planet Aries, to the city Radacitian to save it from the evil Janken the Great. But in the game it tells you have to save the princess form Janken the Great. Your journey goes though 17 levels where you will see water levels, castles, towns levels, air levels and a forest level. You will see a range of different enemies. The developers have used their imagination, and you are not given the same lavel more than once, so you don’t get bored while playing though it. The difficulty in the game isn’t too hard but like many older games, you have to give it a couple of tries. There is some memorization in the game, when you play rock, paper, scissors in the bossfights you have to pick the same every time you play, so after a few playthroughs there isn’t a big challenge in them. Although after the 3 first bossfights there are also some action elements where you have to hit the floating heads while avoiding being hit. 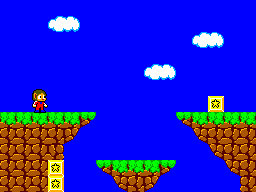 CComparing the graphics to Super Mario bros., Alex Kidd wins. The graphics are much better, you can see his cute little face and it is much more colorful. But the Sega Master System is also known for better graphics than the NES. I think it's easy to see what the objects are representing, although I have been in a discussion or two, about is it a motorcycle or a car. But if that's the only thing in the game, the graphics are great. I love the sound of this game. hym hym hy hym, hy hy hyym. Just love it, and I’m not the only one, a number of different bands have made a cover of the music. For example Los Tronchos on the album: Warcelona. There are some different numbers in the game, so you don't get tired of hearing the same song over and over again. The controls are, if you aren’t use to play Master system Game, a little different. The 1 button jumps and the 2 button attacks. After getting use to it though, the controls are tight, Alex can slide a bit when running and jumping, which can make it harder to jump on to a small platform, but with a quick jump when you land, it possible to do. There is a lot of replay value in AKIMW. The challenge is big enough so you can play it for a while before know it all the way. And even when you know the game as well as your own back pocket, it is still fun to play, for it is an all-time classic. 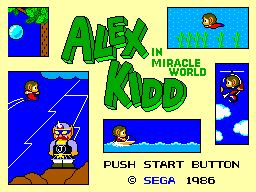 Alex Kidd In Miracle World, is a great game, although I have elements form Super Mario Bros. It is still fun to play. It still play well after 26 years, and if you call yourself a Retro Gamer, I think you have to play this classic, the best way to play it, if you ask me, is on a Sega Master System.